Apartment complex owners, landlords, and property managers know that in order to attract and retain tenants you need to have the best looking property in town and offer something other buildings don’t. And that something is artificial grass. At Turfix, we understand that keeping up appearances is incredibly important to the health of the development. That’s why we install artificial grass on rooftops and balconies and transform these areas into the green spaces apartment dwellers crave. Artificial turf offers more than a safe playing surface for sports fields or pristine, maintenance-free landscapes. Artificial turf can turn any surface, whether a spacious suburban backyard or a pint-sized urban balcony, into an outdoor oasis. While a nice touch, just offering rooftop access isn’t enough. So do one better for your tenants (and one better than your competition). 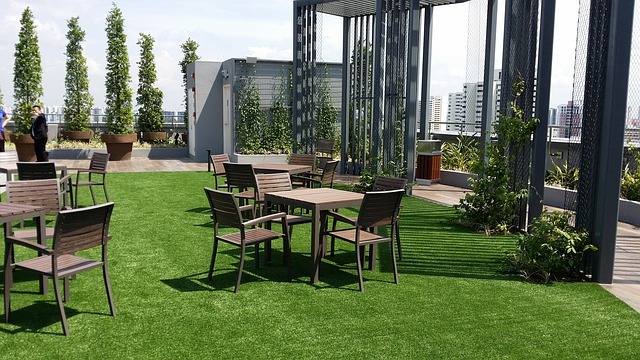 Installing artificial grass can transform dull concrete rooftops into beautiful, functional living spaces where people can gather to socialize and enjoy sweeping city views. Artificial turf is easily installed on rooftops and the durability offered by artificial turf is ideal for high-in-the-sky locations as it retains its color and drainage properties in any and all weather and climates. Relaxing above it all on a private balcony is a perfect way to unwind and enjoy the outdoors amidst the hustle and bustle of city life. Artificial grass can further beautify balconies and upgrade this experience by a million. Nothing beats having the look and feel of grass underfoot, especially when you’re living many stories above the ground. Artificial grass can be cut and placed in any sized space and can transform even the dingiest of balconies into an outdoor oasis. Artificial grass is a worthy addition to any rooftop, balcony, porch, patio, or small space. Artificial grass is durable, convenient, and adds some much-needed creativity to boring or bland spaces in condominiums and apartment complexes. With its low maintenance features and versatility, artificial turf can be enjoyed both up high and down low. Artificial turf provides endless options as to what and where you can place it and installing artificial grass on a rooftop or balcony will certainly set your property apart. Contact Turfix today if you have any questions or to request a quote! If you are an apartment dweller, talk to your landlord or property manager about installing artificial grass in your complex!